This will be the go-to picture for planetary formation in astronomy textbooks. Astronomers at ALMA, the Atacama Large Millimeter/submillimeter Array, have used the telescope's exquisite resolution to take the best-ever picture of planet formation. In the image, young planet-like objects are forming around HL Tau, a sun-like star about 450 million light years away. 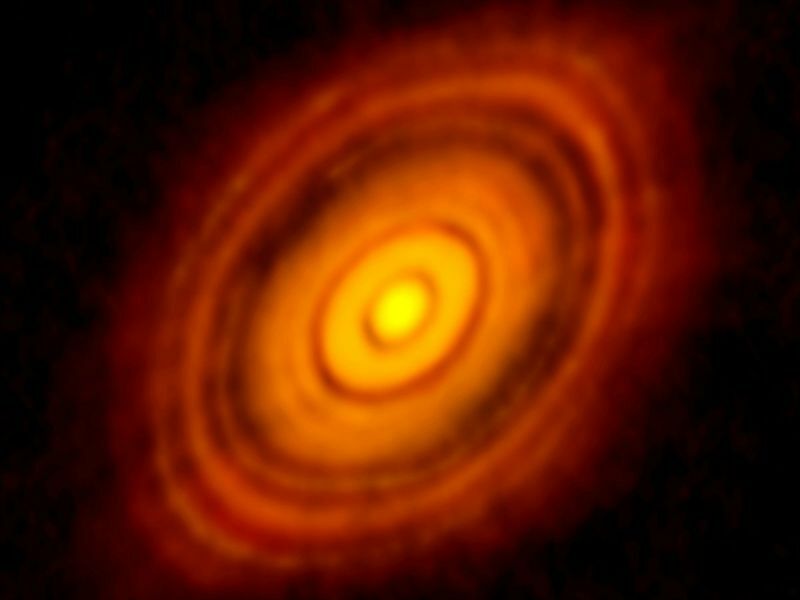 Gas and dust are swirling in a protoplanetary disk around the star, slowly bumping and coalescing as gravity pulls them into more and more substantial objects. Astronomers have never been able to see such clearly defined gaps in the disk, which make it appear as a series of rings. These gaps are made as the planets form and grow, pushing away or sweeping up debris in their orbits. "The first time I saw this image I thought it was probably a simulation, it was just way too good," National Radio Astronomy Observatory director Tony Beasley described in a video. Astronomers were surprised not just at the level of detail revealed, but also that it existed around a star so young: HL Tau is only about a million years old. "Such young stars are not expected to have large planetary bodies capable of producing the structures we see in this image," says ALMA's deputy director, Stuartt Corder. The team expects the image will greatly increase scientists' understanding of the way solar systems form, and that ALMA will keep contributing by revealing even more detail in this and other protoplanetary disks, by observing them in different wavelengths. ALMA is able to see through the gas and dust that hides HL Tau from visible-light telescopes. The array of 66 dishes, which began full operation last year in the Chilean desert, detects light in the radio and microwave spectrum. Read more about ALMA and how it lets astronomers see young planets as well as some of the first stars and galaxies born in the universe.